The bloodletting that accompanied the onset of Prohibition has never been accurately measured, but it was inevitable when suddenly the prospect of enormous profit was dangled before basically not-too-well-to-do criminals. With the end of World War I, there weren't all that many opportunities available for organized criminals. The political bosses did use them to control elections, but unfortunately elections did not come around every month. In the old days the political bosses accepted the responsibility of seeing after their criminal cohorts in "slow periods," putting them to work as bouncers, as shills for gambling joints and whorehouses, and so on. However, this too was changing as reformers—bluebloods, businessmen, the middle class, leaders of various ethnic groups— were demanding a cleanup. In more and more parts of the country political leaders could not operate in such blatant style any more. They had no more use for the criminals and no reason to support them. The Volstead Act of 1919 dramatically altered everything. For criminals, there was a new opportunity for making millions. 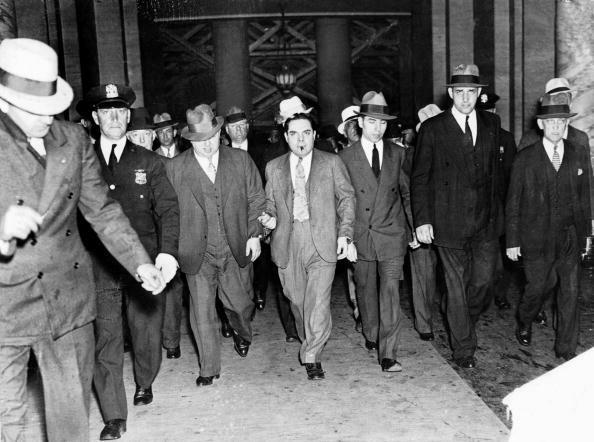 Gangsters slaughtered old buddies to take over bootlegging rackets, and explosions of gunshots and bombs filled the air of almost every American community of almost every size. Yet with exceptions here and there, by the late 1920s peace had settled on the bootleg world. It came through the Seven Group. Forward-thinking gangsters had decided all the warfare was interfering with making money . There had to be peace in obtaining liquor and there had to be an end to gangs hijacking each other's supplies. The answer lay in some sort of organization that could constitute a central liquor buying office to handle all orders for booze and give everyone a fair share. This system would reduce the deadly competition for supplies and the inordinate protection costs for shipments. This would leave the individual bootleg gangs with more than ample time and resources to take care of any freelance hijackers who might be foolish enough to continue to carry out raids. Who deserves credit for originating the idea is difficult to tell, but it was probably either Arnold Rothstein, often called the Brain, or Johnny Torrio , also called the Brain. Certainly both of them—and Meyer Lansky and Lucky Luciano—were all boosting the idea by 1927. The organization known as the Seven Group, since it was originally comprised of seven separate power groups, included Luciano and Frank Costello from Manhattan; Joe Adonis from Brooklyn and parts of Manhattan; Longy Zwillman from New Jersey and Long Island, New York; Waxey Gordon and the rising Nig Rosen from Philadelphia; Nucky Johnson from Atlantic City; Meyer Lansky and Bugsy Siegel, the protection "enforcers"; and Torrio who came out of his Brooklyn retirement to offer organizational advice. When peace suddenly broke out in the midAtlantic area as the Seven Group established its authority, other gangs around the country clamored to join, among them those bossed by Moe Dalitz in Cleveland, King Solomon in Boston and Danny Walsh in Providence. Even Al Capone was attracted but the Chicago gang wars had gone on too long to be simply switched off by an appeal to reason. By the end of 1928 there were at least 22 gangs in the Seven Group. By that time Rothstein had been murdered, apparently not because of a gangland plot against him, but over a huge gambling debt that he had welshed on to professional gamblers. That did not stop the momentum of the Seven Group and it led to the next logical step in the solidifying nationwide criminal link— mafioso, Italian, Jewish, Irish, Polish or whatever. In 1929 the underworld held a vital conference at Atlantic City where plans for new criminal enterprises and cooperation after the end of Prohibition were discussed. Had it not been for the success of the Seven Group such a conference would not have been held and the confederation of the gangs around the country might never have come to fruition nor created the national crime syndicate.